RENE IZQUIERDO, a native of Cuba, graduated from the Guillermo Tomas, Amadeo Roldan Conservatory, and Superior Institute of Art in Havana. In the United States, Mr. Izquierdo earned a Master of Music degree and an Artist Diploma from the Yale University School of Music, where he studied with Benjamin Verdery. While at Yale, he represented the University in an exchange program with the Conservatoire National de Musique et de Danse du Paris and worked with guitarists Olivie Chassain and Roland Dyens. Rene has appeared as a guest soloist and in chamber music concerts throughout the United States, Cuba, and Europe. He has shared the stage with prestigious guitarists including Eliot Fisk, Benjamin Verdery and Jorge Morel, as well as renowned flutist Ransom Wilson, soprano Lucy Shelton, David Jolley, and Paquito d’Rivera. A recipient of numerous awards, Mr. Izquierdo is a winner of the JoAnn Falletta International Guitar Competition, the Extremadura International Guitar Competition, the Schadt String Competition, and the Stotsenberg International Guitar Competition, among others. He is currently a professor of classical guitar at the University of Wisconsin-Milwaukee, and is a solo performer and chamber musician. Rene has studied with Leo Brouwer, David Russell, Shin-Ichi Fukuda, Eli Kassner, Pepe Romero, Angel Romero, Carlos Barbosa-Lima, David Starobin, Eduardo Fernandez, Jorge Morel, Robert Beaser and Anthony Newman. DON LINKE’s career, as a professional musician for more than thirty-five years, has encompassed an impressive range as both a performer and an educator. He has performed both on the road with local rock and blues bands, and as a pit musician with The Melody Top Theatre, the Florentine Opera, the Milwaukee Repertory Theater, the Skylight Opera Theatre, and the Riverside Theatre. Linke has opened for Freddie Hubbard, Stanley Turentine, and Richard Elliot, and has had the honor to have played alongside jazz luminaries Greg Abate, Frank Morgan, Bruce Forman, Richie Cole, Melvin Rhyne and Brian Torfe. His 3D Trio—the main vehicle for his own compositions and arrangements—was named a "must see when in Milwaukee" by Cadence Magazine. Reviews of his solo recordings in String Jazz, Jazz Now, and Jazz Player Magazines describe him as one of a handful of guitarists since Joe Pass to create an immediately recognizable style, and as an artist with a beautiful jazz voice. With his high standards and nurturing attitude, Linke has been a successful educator for more than 40 years, with many of his students developing successful musical careers. In addition to his current role as a lecturer at the University of Wisconsin-Milwaukee’s Peck School of the Arts Jazz Guitar Program, he has previously taught privately as a studio instructor and at the Wisconsin Conservatory of Music, the University of Wisconsin-Waukesha, and the Waukesha Technical Institute. He is also a sought after clinician and has led workshops and master classes for the Guitar Foundation of America, Purdue University, University of Wisconsin-Stevens Point, and McPherson College. In addition, he has published three educational works being used as part of the music curriculum at the University of Wisconsin-Milwaukee, and has released five recordings. As a member of Punch Brothers since the band's inception, guitarist CHRIS ELDRIDGE has been at the vanguard of acoustic music for much of the past decade. He was initially drawn to the electric guitar, but by his mid-teens, had developed a deep love for acoustic music, thanks in part to his father, a banjo player and founding member of the seminal bluegrass group The Seldom Scene. Eldridge later gained in-depth exposure to a variety of different musical styles while studying at Oberlin Conservatory, where he earned a degree in music performance in 2004. During his time at Oberlin, Eldridge studied with legendary guitarist Tony Rice. After graduating he joined the band Seldom Scene with whom he received a GRAMMY® nomination for the album Scenechronized. While still playing with the Seldom Scene, he moved to Nashville, TN where he was a founding member of the critically acclaimed bluegrass band The Infamous Stringdusters. At the 2007 International Bluegrass Music Association awards, Eldridge and his Stringdusters bandmates won “Emerging Artist of the Year,” “Song of the Year,” and “Album of the Year” for their debut album, Fork in the Road. Meanwhile, in 2005, he had caught the attention of mandolinist Chris Thile, who enlisted him, along with banjoist Noam Pikelny, violinist Gabe Witcher, and bassist Greg Garrison to start working on an ambitious side project. The project centered around a suite Thile was writing whose goal was to fuse the aural traditions of folk with the intellectual rigors of formal composition. In March 2007, the quintet premiered the suite, The Blind Leaving the Blind, at Carnegie Hall’s esteemed Zankel Hall. Soon after they decided to focus all of their collective energies into this band and Punch Brothers was born. Chris Eldridge has worked with a host of musical luminaries including Jon Brion, Fiona Apple, John Paul Jones, T-Bone Burnett, Elvis Costello, Jerry Douglas, Julian Lage, Dierks Bentley, Sara Watkins, Del McCoury, and many others. Hailed by All About Jazz as "a giant in the making," JULIAN LAGE grew up in California and was the subject of an Academy Award-nominated documentary, Jules at Eight. He gained pivotal early exposure as a protégé of legendary vibraphonist Gary Burton, recording and touring with Burton on two projects: Generations (2004) and Next Generation (2005). Other recent high-profile sideman appearances include Lucky To Be Me and Let It Come To You by longtime friend and close collaborator, pianist Taylor Eigsti. Having reunited with Gary Burton for live engagements beginning in 2010, Julian can also be heard this year as a member of the "New Gary Burton Quartet" on the forthcoming CD Common Ground (featuring Scott Colley and Antonio Sanchez). Lage's recent trio appearances with fiddle master Mark O'Connor (also collaborating with the violinist's group, "Hot Swing") and bass giant John Patitucci have only strengthened the imprint of Americana and acoustic music on his work. In fact, Lage debuted on record at age 11 on Dawg Duos (1999), featuring David Grisman, Vassar Clements, Edgar Meyer, Béla Fleck and more. "Those were my heroes," Lage marvels. (He went on to recruit Fleck for three tracks on Sounding Point.) With his album Sounding Point, Lage arrived at a unique approach to composition and ensemble craft, a searching yet accessible sound that earned him his 2009 GRAMMY® nomination for “Best Contemporary Jazz Album.” The music was “a major find,” declared Time Out New York “springy, intelligent chamber Americana that fits perfectly into a spectrum of Nonesuch-style players like Bill Frisell and Chris Thile's Punch Brothers.” This new album represents another stage in that evolution, building on the proven strengths of and solidifying a unique identity for Lage's working band but continuing to open new doors and exploring new horizons. Celebrating over 30 years of musical accomplishments, virtuoso lead guitarist DARYL STUERMER of the super-group Genesis and Phil Collins has been touring the world to sold out crowds since 1978. Discovered while playing with his Milwaukee band, Sweetbottom, guitarist Daryl Stuermer made a fan out of Frank Zappa’s then-keyboardist, George Duke, who set up an audition for Stuermer to try out for acclaimed jazz violinist Jean-Luc Ponty. Stuemer burst into the international music scene, joining Ponty first on a European tour and then recording on his four innovative albums. In late 1977, Stuermer was recommended as a replacement for longtime member Steve Hackett for the British progressive rock super-group Genesis, beginning his 30 year “permanent part-time stint” as lead guitarist with Genesis, touring the world to sold-out crowds and performing on seven Genesis albums. When Genesis drummer/singer Phil Collins launched a solo career during the early 80s, Stuemer became an integral member of the Collins’ solo band. 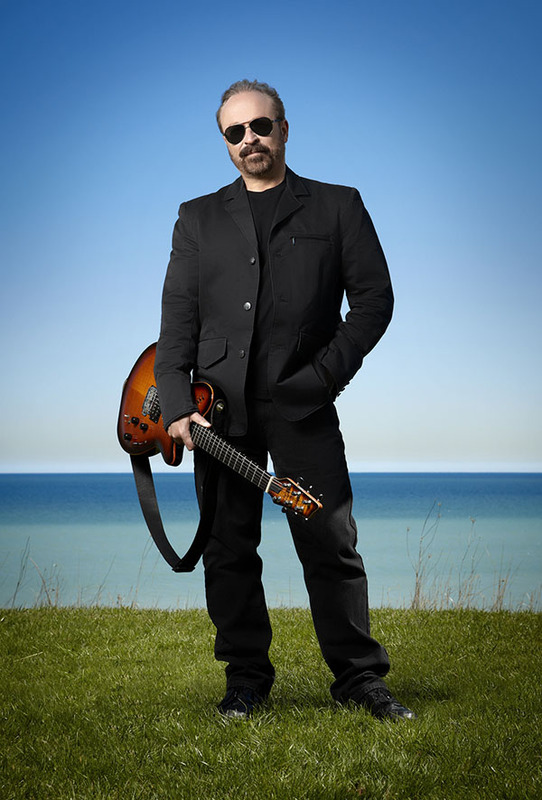 Stuermer created the signature guitar sound of Collins’ solo mega hits “In the Air Tonight” and “Easy Lover,” and was co-writer of Collins’ 1989 GRAMMY® Award-winning and Billboard No. 4 single “Something Happened on the Way to Heaven.” Stuermer’s versatile jazz work can be heard on nearly all of Collin’s albums including 1981’s Face Value, 1985’s No Jacket Required, 1990’s But Seriously and 1996’s Dance into the Light. In addition he has performed on albums by Jean Luc Ponty, Frida Lyngstad (ABBA), Philip Bailey (Earth, Wind, & Fire), George Duke (Frank Zappa), and many others. In between the touring years, Stuermer launched his own independent record label, Urban Island Music, and continues to write music for his nine solo albums—Steppin' Out, Live and Learn, Another Side of Genesis, Waiting in the Wings, Retrofit, The Nylon String Sampler, Rewired: the Electric Collection and Go! which showcases his acclaimed blend of rock and jazz guitar featuring original music, as well as unique Genesis renditions. Stuermer tours with the“Daryl Stuermer Band” performing in duo, quartet, five-piece and full symphonic shows throughout the world.